Shrink to the size of an atom. Teleport to Mars. Bowl with John Lennon & Liz Lemon. Free your dreams! 6,557 backers pledged $572,891 to help bring this project to life. Remee has been selected as a finalist for the William McShane Fund, by Buckyballs & Brookstone! If you think Remee deserves to be available at Brookstone, vote here! Yes, really! For nearly as long as recorded human history, the idea of consciously recognizing and controlling our dreams has been around. From the Hindu Upanishads to Aristotle's On Dreams, people have been puzzling out the mysteries of lucid dreaming for centuries. These days, there's more information on Lucid Dreaming, the science behind it, and modes and methods of experiencing it than there ever has been. Yet the idea still remains relatively unknown to the average person. To us, this is kind of a shame, sort of like being unaware of the existence of books or music. Lucid Dreaming can be one of the most profound things you can experience in this life - but explaining it to someone who has never done it can be a bit difficult. It is so visceral and hard to put into words that it can rarely be related in a meaningful way to a non-lucid dreamer. Conversely, when a lucid dreamer meets another lucid dreamer comin' through the rye, general excitement and lots of note-comparing ensues. It almost feels like a secret club. We want you to be in that club, too. This is an easy one. 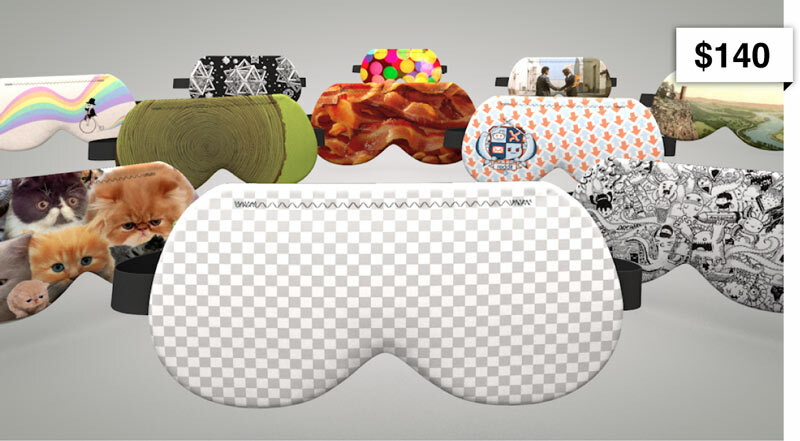 You saw in our video some of the more creative applications of Lucid Dreaming. Sure, you can perform any feat from the sublime to the superhuman. But the potential benefits of lucid dreaming are truly limitless. Flying through the galaxy riding a giant kitten might not be your thing, but what about having a roundtable discussion with your ego and id? Maybe you can finally get over your fear of public speaking in the safety of your own dreams. What about trying to write a short story, or compose a melody? Paul McCartney and Mary Shelley, among others, might have a lot to say about harnessing the creative power of dreams. Build skyscrapers in your mind, attack unsolved mathematical problems, or just try and figure out what happened at the end of Lost. Lucid dreaming is a path, a journey - what lies at the end of the path, magnificent or mundane, is your call. There's a lot more to Lucid Dreaming than simply acknowledging that it's real and crossing your fingers. It's tough! Your body has a been dreaming one way for your entire life, so teaching it to dream a new way requires some effort. Dozens of websites have cropped up where lucid dreamers, novice and expert alike, flock to swap stories and tips. Some of these techniques include Reality Checks - a quick "lucid test" that requires forming simple habits during waking life that you then perform during dreams. Other methods, like WILD (Wake Induced Lucid Dreaming) involve taking a very active role in the process of falling asleep, which can lead to entering directly into a dream from wakefulness. Remee aims to make all of this a lot easier by providing recognizable external input into your dreams. You may find that you don't have to remember to ask "am I dreaming?" and count your fingers - with its customizable light patterns, Remee is doing the reminding for you. You may find yourself sitting at an outdoor bistro with Ellen Page and suddenly a soft pattern of red lights appears in your field of vision. Back and forth. Back and forth. "That looks familiar." you think. Wait. Remee! That's Remee! I'm dreaming! This is a dream! Boom. Congratulations. You're lucid. With luck, and a little help from Remee, you can stay that way! WNYC's Radiolab - We've been listening to Radiolab for ages, so we thought it was great when they recently released a short about someone using lucid dreaming to overcome a recurring nightmare. The podcast has a great overview of lucid dreaming and is as usual well produced and entertaining. /r/LucidDreaming - Reddit's active, knowledgeable, helpful Lucid Dreaming community. 25,000 dreamers strong and growing! In default mode, Remee targets these long chunks of REM sleep towards the end of the sleep period. Before bed, turn Remee on, fine tune the brightness of the lights (if needed) and then go to sleep. Remee will wait for an initial long delay, usually 4-5 hours, until you're in the heart of the heavy REM stages, before initializing light patterns. After the initial long delay Remee will display light patterns for 15-20 seconds with a second shorter delay, default at 15 minutes, between each signal. During non-REM sleep the lights are unlikely to effect you, but if you're in REM sleep the lights will bleed into your dreams, presenting a perfect chance to become lucid. We spent a lot of time making sure that Remee's lights were configured in such a way that it would work well for all face shapes and head sizes. Six lights creates a much larger effective signal area so that even if the mask shifts during sleep you'll still most likely have at least a few lights over your eyes. Even cooler, by having six lights we make it possible to create much more unique signals that can strobe, sweep and blink in ways that are not only recognizable, but that stimulate your visual field in a more tangible way. In addition, red light penetrates skin much more readily than other wavelengths. Remember when you were a kid and you put a flashlight in your mouth to make your cheeks glow red? That happens because red light is able to pass through your skin, and in the case of Remee, your eyelids, much more easily. On a side note, red LEDs also use much less power than other colors so we were able to keep you from strapping a 9v battery to your head. You bet. You'll be able to edit the standard full night sleep long delay and short delay, as well as setting both the short and long delay for nap mode. Nap mode lets you trigger signals after a delay as short as 15 minutes - perfect for a quick lucid siesta. This is also great for the Wake-Back-to-Bed technique, which veteran oneironauts can attest is one of the best methods for lucid dreaming. In addition to setting Remee's timing, you'll be able to select from a variety of unique signal patterns and also modify the brightness to suit your paper thin or ogre thick eyelids. I own a soldering iron, give me specs! Congratulations, you're probably into tinkering and hacking just like we are, and most likely you want to know the skinny on Remee's guts. Remee is built around an atmega168 running on the internal oscillator. Which means its fully compatible with the Arduino IDE. If you're inclined, you'll be able to load whatever code you like on Remee and we'll be sure to create a tutorial to show you how. We are working on a simple way to hook an ISP to the board with no soldering or messy wires too. The light sensor bit-banging is pretty cool and we can't wait to share that with the world with a forthcoming tutorial, including part numbers and settings so you can use it in your own projects. We will update as things move along. $5 Reward: Remee wooden coin, laser cut by us in Brooklyn. $15 Reward: Remee dream journal printed on 100% recycled paper. Pen included. 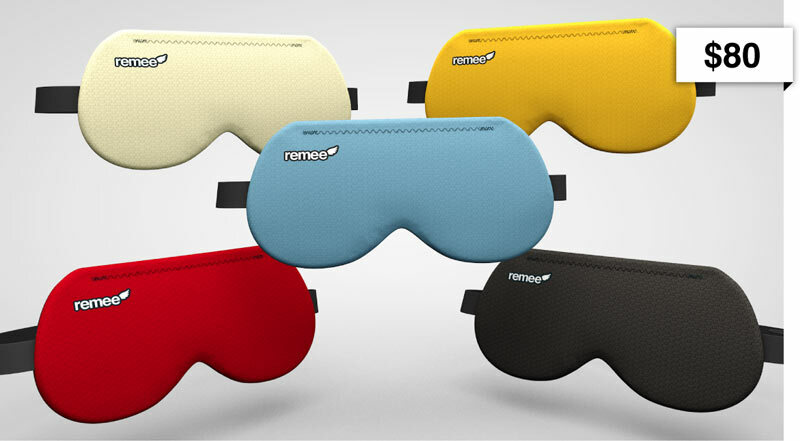 $80 Reward: Your very own Remee, in your choice of 5 colors. $100 Reward: Remee SPACE EXPLORATION Limited Edition! $140 Reward: Remee with custom artwork, printed using high quality dye sublimation. THANK YOU. We are passionate about bringing Remee to market and helping people lucid dream, and every pledge helps. 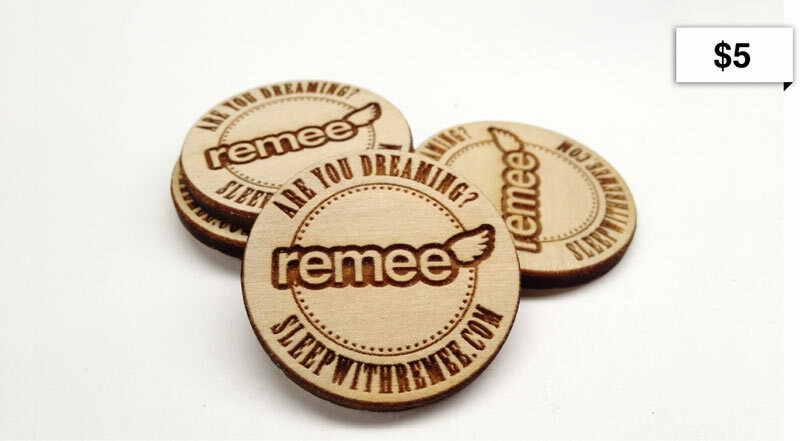 Remee wooden coin! Laser cut by us in Brooklyn, a great reality check token and even better conversation piece. Continental US only. Thank you for your support! Meticulously chronicling your dreams is one of the best known ways to help increase lucidity. Patrons at this level will receive a handsome Remee dream journal printed on 100% recycled paper. Pen included. Includes shipping to the continental US. Add $15 for international shipping. Congratulations! 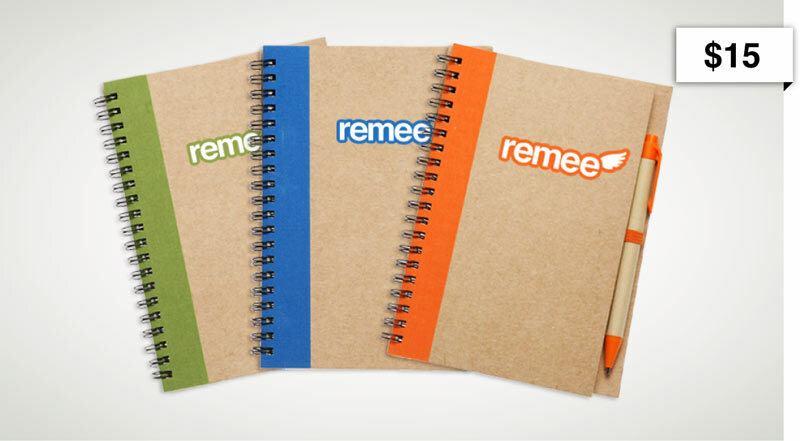 You've just ordered one Remee in the color of your choice. Increased lucidity is just around the corner! Thank you for supporting our project. Includes shipping to the continental US. Add $15 for international shipping. Space-age Congratulations! One Remee "Space Exploration!" Limited Edition in the interstellar print of your choice will soon be in your hands! When you are gliding serenely above the rolling plains of a far distant planet, think fondly of us. Includes shipping to the continental US. Add $15 for international shipping. Thanks to our wonderful partners, we are able to offer the option to have your Remee look however you like! Simply provide us with a high-quality image and we'll do the rest. Thank you for supporting Remee! Includes shipping to the continental US. Add $15 for international shipping. The Twofer, for those of you who asked what to pledge to receive two Remees. Includes shipping to the continental US. Add $15 for international shipping. The Space Twofer - One Limited Edition Space Remee, one standard Remee. Includes shipping to the continental US. Add $15 for international shipping. The Connoisseur - One Custom Remee and one standard Remee. Includes shipping to the continental US. Add $15 for international shipping. Friends & Family package! Order 10 standard Remees and you'll save $100. 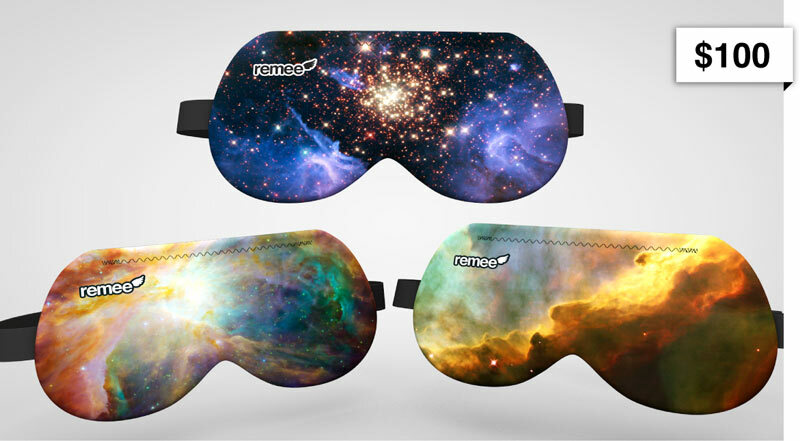 Bring lucid dreaming to everyone in your house, on your block, or in your cult. Just kidding. Seriously. No cults, please.